Designed to seat 17 people and up to 2 wheelchairs. Whilst we carry a large stock of White and Silver with the odd different colour too, all Peugeot colours are available to order. There are 2 different reds, 3 different blues along with black. The base Peugeot vehicle features a 2.0 BlueHDi Euro 6 diesel engine and 6 speed manual transmission, meaning excellent performance combined with impressive fuel economy and low emissions. The CanDrive EasyOn 17 Seater is IVA tested and has a GVW of 4.25ton so may be driven on a standard B driving licence, meaning no expensive and time consuming D1 licence training required (conditions apply*). Heated electric wing mirrors with 4-way adjustment, electric windows, Bluetooth connectivity, DAB radio, remote central locking, height adjustable drivers seat and steering wheel are standard equipment. Featuring removable rear saloon seating with room for 2 wheelchairs and manual fold out ramp. For an affordable £16 per day we will match you with an ideal minibus so you can see how much convenience it offers, saving you countless hours spent organising transport and potentially reducing your costs. 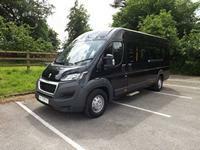 Minibus leasing, long term hire and minibus contract hire options (with or without servicing) are available on this Peugeot Boxer 17 Seat Wheelchair Accessible Minibus.